Mumbai Cricket Association formerly known as Bombay Cricket Association was established in 1930 and is the governing body for cricket in Mumbai, Greater Mumbai and Thane districts. The jurisdiction of MCA includes the area up to Dahanu in the Western Suburbs, Badlapur in the Central Suburbs, and Navi Mumbai up to Kharghar. 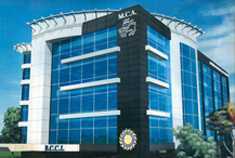 MCA is a permanent member of the Board of Control for Cricket in India and houses the Headquarters of the BCCI in Cricket Centre within the Wankhede Stadium premises. Mumbai Cricket Association has a democratic set up and the affairs of the Association are run by a Managing Committee which is duly elected every two years by the General Body consisting of 350 member clubs. There are no individual members in the Association. Mumbai Cricket Association has a rich cricket heritage thanks to the quadrangular and pentangular tournaments played in then Bombay, the matches were extremely popular with all the star cricketers of the country participating in them. Mumbai was considered as the nursery of Indian Cricket and there was a time when the Indian playing eleven consisted of six to seven Mumbai cricketers. Mumbai has given the country 68 Test cricketers. The first Test match on the Indian soil was played at the Bombay Gymkhana ground in 1932. Thereafter up to 1974 Test matches were played at the Brabourne Stadium and since January 1975 the international matches are played at the Wankhede Stadium. When the Wankhede stadium was undergoing redevelopment, a Test match was played at Brabourne Stadium in December,2009 and an ODI was played at the D.Y.Patil sports complex at Nerul in November,2009. Mumbai Cricket Association has dominated the Ranji Trophy Championship, the National Championship conducted by the BCCI since 1934. MCA has won the Ranji Trophy 41 times and was runner-up on five occasions. MCA won the Ranji Trophy 15 years in a row which in itself is a world record. Of late our performances have not been consistent. The Association has taken upon the task of building new infrastructures in the far off suburbs. MCA has developed the MCA Recreation Centre at the Bandra Kurla Complex which houses one of the best Indoor Cricket School in the world. This complex also includes a full fledged cricket ground where Ranji Trophy matches are played. MCA has also developed Recreation Centre at western suburb of Mumbai, Kandivali. The Recreation Centre is named as "Sachin Tendulkar Gymkhana". MCA undertook redevelopment of Wankhede Stadium in preparations for the ICC Cricket World Cup and the stadium was completed in time to stage the world cup matches and the venue entered the world cup history books as this was the first time in 10 world cups that the host country won the championship.